I decided to throw a cup away! It is a cup with a chip on the edge that I have been keeping for a while. The cup has a unique design. When you pour some liquid to the under the painted hotel, a lake appears in the cup. I really like this kind of clever design. This cup is one of the goods from the Hotel Butterfly series. Hotel Butterfly is a fictitious hotel created by a graphic designer. 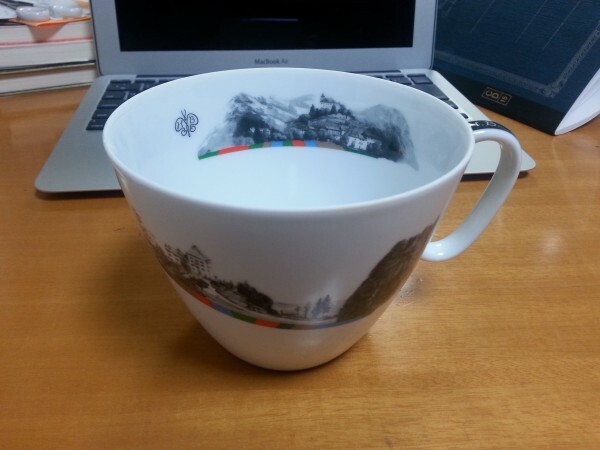 By the way, I also have another cup with a different design in this series. 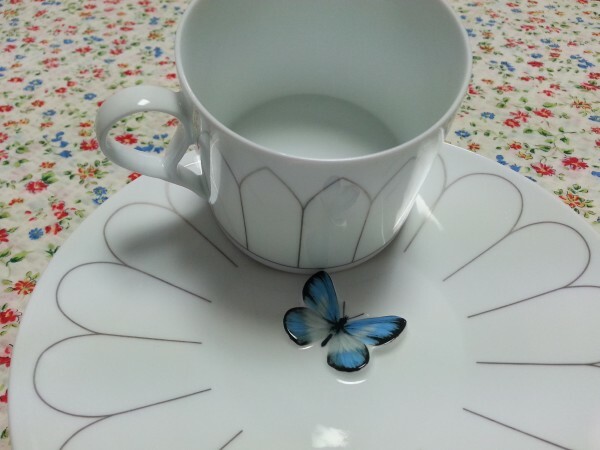 When I pick up from the cup saucer, a three-dimensional butterfly appears on the saucer. It is a little surprise, isn’t it!? Hotel Butterfly is in some European country in my mind. These goods are sold by a design company called D-Bros. D-Bros designers also designed the logo of the shop “Pass the batten” at Marunouchi in Tokyo. Anyway, I decided to say good-bye to my cup, regardless of how much I like it and how expensive it was! !